GUUS HIDDINK STEPS IN - HERE'S WHAT HE MUST DO FIRST! 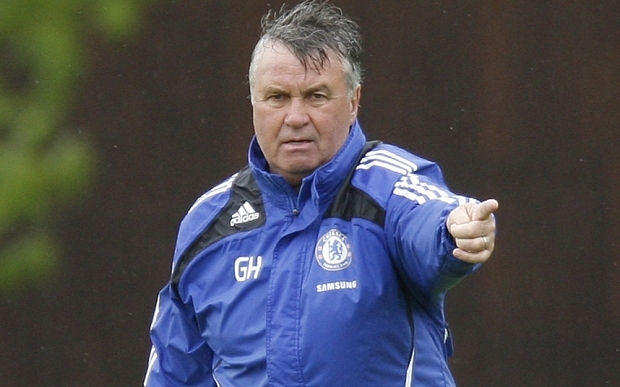 As expected, Guus Hiddink is about to be confirmed as Chelsea's Interim Manager until the end of the season. THIS is what he MUST do first! He has to make the tactical switch to 4-3-3, anyone looking at our squad can see that the players we currently have are naturally suited for that formation and the bloody 4-2-3-1 we have adopted simply doesn't work anymore. Just look at our squad. Look at our defensive midfield options and you will understand where I am coming from. Nemanja Matic and Mikel are the ONLY two defensive minded midfielders we have. Cesc Fabregas cannot do a job there anymore as he becomes exposed in that position. He cannot tackle to save his life and he is too slow. When playing next to him, Matic has to cover ALL the ground around him in that area and this is where our problems lie. Just look at Matic against Porto - My man of the match that night. He had Ramires alongside him, a willing worker and someone who can at least make telling tackles at different points in the game. Matic felt comfortable with the Brazilian next to him and he knew he only had to focus on his role and was outstanding. Guus Hiddink has to see this, anyone with half a football brain can see it and it's such a simple solution because by adopting the 4-3-3 it allows the players to play to their strengths in their natural positions and to express themselves more. Look at what we are currently asking of our wide men. Track back, work hard up and down and to do a job defensively. Why not take those duties away from them, ask them to play higher up the pitch and to influence the game there as in the days of Arjen Robben and Damien Duff? The 4-3-3 formation allows Matic to sit at the base of the midfield and for two players to play alongside him with licence to influence the game further forward. Why not play Fabregas and Oscar next to him? Ramires and Loftus- Cheek? Players who all like to get forward and without doing a disservice to Ramires, the other three can play a hit with the ball at their feet too! Defensively, the two midfielders would need to step wide and work with their fullbacks from midfield to protect them and not the wide men. The formation would remain rigid and people would stop playing across the bloody pitch in these free roles, swapping positions and confusing things. Up top, Diego Costa, Remy or Falcao would play as the target man knowing they had two players Hazard and Willian/Pedro playing up alongside him. This would stop Costa making these ridiculous runs into the channels and wide ares as he would be asked to play the width of the penalty box. The problem for Costa this season and in recent games is that he has become isolated up front because the wide players are asked to track back when we do not have the ball. As soon as we win it, there is a huge gap between Costa and the rest of the team which is easy to defend against. The 4-3-3 formation is rigid as I have said but is also fluid. Players have defined roles and by playing three players higher up in attacking areas, not in attacking midfield positions but right up alongside Diego Costa, it gives the opposition something to think about and they have to keep FOUR players back in defensive areas to cover. This should allow us to dominate games. For me it's a MUST because we have squad that's naturally suited to it. Surely Guus Hiddink will realise the same starting tomorrow!